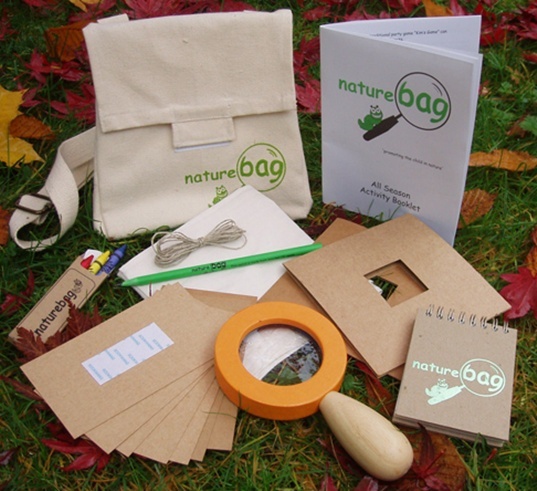 The Nature Bag encourages children and their families to get out into nature and unearth lots of fun. The kit includes: a Fair Trade 100% certified organic cotton shoulder bag, an all season activity booklet, 2 leaf viewers, 8 color cards, recycled notepad, recycled pencil, soy based crayons, hemp twine, organic cotton blindfold, and a rubberwood magnifying glass. Suggested activities: “Go on a scavenger hunt, walk with bugs, hug a tree, make dough imprints, look closely at the patterns in a leaf, try some wild weaving and more!” Activities like this are educational, fun, and crucial… if our kids don’t learn to appreciate and enjoy nature, we can’t expect them to preserve it. The Nature Bag encourages children and their families to get out into nature and unearth lots of fun. The kit includes: a Fair Trade 100% certified organic cotton shoulder bag, an all season activity booklet, 2 leaf viewers, 8 color cards, recycled notepad, recycled pencil, soy based crayons, hemp twine, organic cotton blindfold, and a rubberwood magnifying glass. Suggested activities: "Go on a scavenger hunt, walk with bugs, hug a tree, make dough imprints, look closely at the patterns in a leaf, try some wild weaving and more!" Activities like this are educational, fun, and crucial... if our kids don't learn to appreciate and enjoy nature, we can't expect them to preserve it.